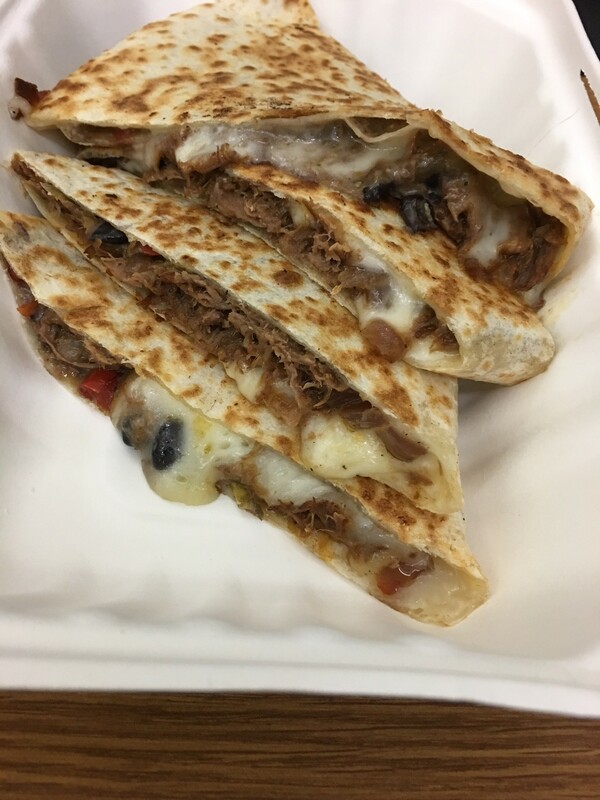 However you say it, it’s a great place that makes quesadillas, and that’s about the size of it. Quesadillas and soft drinks. The dillas cost more than your typical fast-food variety, but you should consider what you’re getting. A simple cheese (cheddar or white blend) quesadilla runs $4, but anything beyond that ranges from amazing to spectacular. Want vegetarian? The Atomic Veggie explodes with pico de gallo, black beans, and fajita veggies with the white blend for $5.50. Their veggies are not limp. They have pride. Who is Evan Boling, and why is his name on this quesadilla at Quesadilla Gorilla? The Classic piles chile verde atop black beans and Spanish rice, with the white stuff. It’s habit-forming. If you can imagine the taste, you’ll want one. If you can’t imagine it, there isn’t much hope for you. 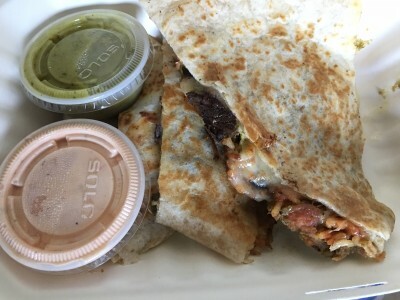 With the dillas, you can choose two sauces, ranging from a smoky Roasted Sour Cream to an Avocado Salsa, or raise the heat quotient all the way to a Habanero Salsa. Ole! Meats can be doubled if you say, “Kong it!” ($4 extra). There’s a BIY (Build Your Own) option that lets you tailor your dilla according to your culinary desires. The menu may not be extensive, but each day offers a special, opening whole new worlds of culinary pleasure. Luigi’s Revenge offered pepperoni, salami, roast beef, red onions, peppers, and olives with white cheesiness. 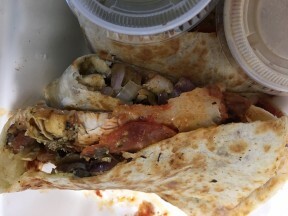 Total Eclipse of the Heart stopped my breath with chicken, bacon, pepperoni, red onion, mushroom, fresh marinara, and parmesan and white cheeses, a veritable folded pizza. Quesadilla Gorilla started as a food truck, but now there are three locations. Open Monday-Saturday; 11 a.m.—8 p.m. Call in your order (559) 636-6375 during business hours; All Call-in Orders STOP at 7:45 p.m.
Open Monday-Saturday; 11 a.m.—10 p.m. 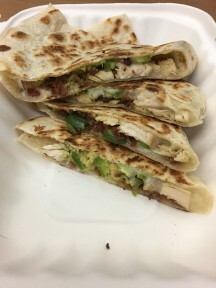 Call in your order (559) 412-7468 during business hours; All Call-in Orders STOP @ 9:45 p.m.
You can pay less for a quesadilla at other places, but you’ll get less.